I was very happy recently to publicly launch the plan I have been working on for a new multi-modal transportation hub in Ewing, New Jersey. The air/rail connection will fit with Ewing redevelopment plan for a new mixed-use town center on a brownfields site in this inner-ring suburb (my previous posting here). The presentation by county and municipal consultant teams was made to the Mercer County Board of Freeholders (stories here and here) – the local governing body – who received it warmly. I was leading the county team (focused on the airport), which has recommended a new terminal – moved to the town center! – and various other economic development measures. The news stories were pretty accurate but missed some of the exciting possibilities generated by co-locating a new airport terminal (with growing regional service provided by a new carrier in the market, Frontier Airlines) and a regional train station (service currently south to Philadelphia, later north to New York). Future high quality rapid transit is under consideration from Ewing to downtown Trenton, the state capital, and to Princeton. The resulting Trenton-Princeton-Ewing Triangle can have a huge economic leverage effect! One of the newer ideas being launched for dealing with the transportation funding crisis is greater use of sales taxes. In recent days, Governor Bob McDonnell of Virginia, Governor Deval Patrick of Massachusetts, and outgoing AASHTO president John Horsley have all put proposals on the table. They would all use the sales tax in some way, but the contents and effects of the proposals varies widely. · The sales tax in general is a very regressive tax. · Eliminating the motor fuels tax removes some (albeit small) incentives for driving economical cars, using transit, reducing miles traveled, etc. · It severs the “user fee” link for transportation funding. · Worst, it pits transportation uses directly against health, education, and other social needs, both now and in the future. Governor Deval Patrick’s proposal has much more to recommend it. In his “state of the commonwealth” address, he proposed reducing the current sales tax from 6.25 percent to 4.5 percent and dedicating all of the proceeds to a “public works fund” for transportation, school buildings, and other infrastructure. The loss of sales tax revenue to the general fund would be offset by an increase in the income tax. The existing motor fuels tax would be retained, possibly with an indexing provision. The increased transportation revenues would be used to pay for a set of projects and programs outlined in Massachusetts DOT’s recently published transportation plan, The WayForward: A 21st Century Transportation Plan. As I have said before, looking for alternatives to the motor fuels tax to fund transportation reminds me of looking for alternatives to a hammer to drive in nails. You may find something that works, but the best tool for the job is being overlooked. The London underground just turned 150 years old and is looking pretty good! Sure we can complain about the shortcomings in the system, and there are some. But that system has been working pretty darn well for a century and a half, which is a remarkable achievement for any piece of engineering. Just try to imagine London without the tube. 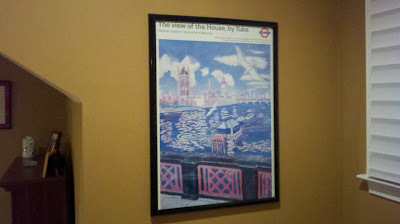 It seems to me pretty obvious that London without the tube would be a much worse, and maybe pretty awful, place. I don’t think there is a better example anywhere of how a well-designed and well-built transport (sic) system can support a civilized society. And for many of us, the public history is enriched by our own personal histories of rides taken and memories cherished. Two articles in the December edition of Atlantic magazine highlight the very encouraging and exciting trend of “insourcing” – starting or relocating manufacturing operations in the United States. “The Insourcing Boom,” by Charles Fishman, focuses on the remarkable rebirth of manufacturing at GE’s formerly rusting Appliance Park in Louisville. James Fallows’ “Mr. China Comes to America” starts with an eyewitness account of the social and economic changes underway in Shenzen. · Labor, as a percentage of total cost in manufacturing, is declining. · The cost of labor in China is increasing. · The cost of shipping (fossil fuels) is increasing. · Some newer manufacturing techniques (especially 3D printing) are better served by small-scale operations. · Perhaps most critically, manufacturers are becoming more sensitive to the need to accelerate the design-to-manufacturing-to-shipping cycle and feel that controlling the whole process in one place with one team (including designers and engineers and hourly workers) gives the best value. All great stuff for sustainable economic development in the U.S.! How do we in the transportation community respond to these changes? In recent years, there has been a significant increase in public investment in freight infrastructure, oriented mainly toward subsidizing the import economy – what I call the Shenzen-to-Walmart supply chain. Billions of dollars have been pumped into port improvements and double-stack rail corridors. And certainly there will continue to be major imports. But a manufacturing sector that is more domestic, more localized, more oriented toward speed, more focused on nimbleness, will make demands on the transportation sector that we are not fully prepared to meet. More to come on this topic. And what a better way to start the year than with free transit! 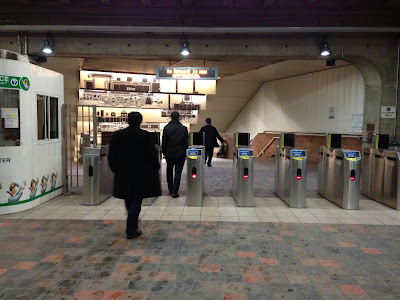 (Photo of Davis Square Station in Boston, New Years Eve). So we didn’t go over the cliff (which may or may not have been a good thing) and have much work to do this year to make our transportation system, and communities, and our nation better. More about all that to come.